Employers looking for a space to interview students on campus have a variety of options offered by the Career Center. The Career Center has 12 readily available interviewing rooms. Should there be a need for more rooms, the Career Center can partner with New Student Services to get 11 additional rooms. Four of the 12 interview rooms are equipped with virtual capabilities. Employers have two options to reserve a room within the Career Center. Both are free of charge. Room only reservations allow employers to book a room in the Career Center to host their interviews. With this option, employers are entirely responsible for scheduling their interviews with students. Room only reservations require a two-day notice to the Career Center. The more traditional option is scheduled interviews. With scheduled interviews, the Career Center handles all contact with the students to let them know whenand where their interview is. This option allows students to pick a time slot that works best for them within an employer’s visit to the campus. This option requires three weeks notice. Room only reservations and scheduled interviews are not offered until the first Monday of October in the fall semester or the first Monday of February for the spring semester. Employers interested in hosting interviews before then are encouraged to participate in next day interviews. 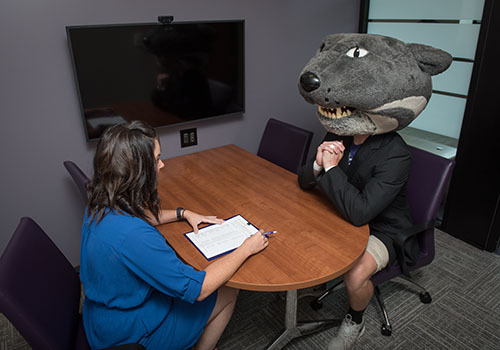 Next day interviews are hosted following K-State career fairs. The Career Center offers space to employers, but the recruiters are expected to manage their own interview schedules. A reservation for this space needs to be indicated when signing up for career fairs. For more information on arranging an on-campus interview, please visit the Career Center website or call the Career Center at (785) 532-6506.